Internet access can make a train trip far more productive and enjoyable. But train-mounted satellite dishes that send and receive data can’t be used on a lot of routes, as the standard hardware is too big to fit in some tunnels. Now researchers at the University of York, in England, have developed an alternative: a dome-shaped plastic lens that’s less than half as high as a typical satellite dish. The system, which was developed with funding from the European Space Agency, is also designed to track multiple satellites at once, making it more reliable than a dish. “Here in the U.K., a lot of our railway infrastructure is very old,” says John Thornton, a research fellow in the Department of Electronics at the University of York, who led the lens research. Low bridges and tunnels offer minimal headroom for satellite dishes, which Thornton says are about 62 centimeters high. Thornton’s lens, in contrast, is only 30 centimeters high–short enough to meet the needs of the train industry. The York project is based on an existing design, called a Luneburg lens. “The traditional approach would be to make [the lens] out of novel materials with certain properties,” says Thornton. “I thought, ‘What materials are practical and could work? '” Ultimately, the team decided on the plastics polyethylene and polystyrene, which are less expensive than the materials traditionally used to make Luneburg lenses but achieve the necessary performance. Thornton says that recent laboratory tests confirmed that the lens was able to receive digital video broadcasts, meaning that it could handle at least four megabits of data per second. The York system also offers increased reliability. With a traditional satellite system, a separate dish is required for each satellite, and the whole dish has to move to track the signal. Moving an entire dish is fine if it’s mounted on a stable structure, such as the roof of a house, but not if it’s affixed to the side of a train that’s running through tunnels and under bridges. A lot of room is required around the device at all times, to ensure that it doesn’t hit something while tracking a signal. 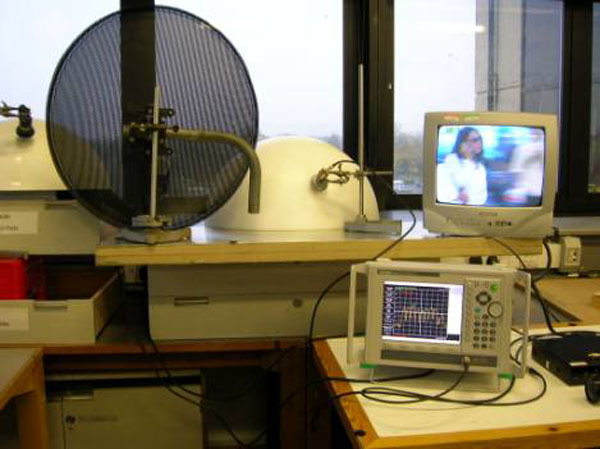 A black satellite dish of the type currently used to send and receive satellite data (left) is clearly much taller than the white lens (center) developed at the University of York. The television (right) displays a video broadcast picked up by the lens. Credit: John Thornton and Andy White, University of York, U.K.
With Thornton’s device, incoming radiation bounces off the surface on which the lens is mounted. The lens concentrates the reflected radiation to a single point on its surface, where it’s collected by a motorized antenna called a feed. To track the signal, only the feed needs to move, as opposed to the entire dish in a conventional system. Moreover, several feeds can roam around the surface of the lens at once, collecting signals from satellites in different locations. Having extra feeds increases the redundancy of the system, Thornton says. “If one of the possible feeds isn’t working, then you’ve got a spare.” Different beams could also be enlisted for different services, he says, noting that one could be used to provide live television while another is used for Internet access. Ratul Mahajan, a researcher with Microsoft’s networking group who has been working on wireless Internet connections for cars, questions why Thornton chose to use satellite Internet instead of 3G, a telecommunications standard that’s becoming common in cellular-telephone networks. “Why use satellite at all?” Mahajan asks. Thornton says that 3G currently doesn’t have the kind of geographic coverage required for continuous Internet access along train routes. Upgrades to the cell network, he says, tend to be concentrated in towns. “Each base station can only offer the highest data rates to users typically one or two kilometers away, so a truly vast number would be needed to cover all the railway routes in a country the size of the USA, or even France,” Thornton says. Thornton is currently trying to find a commercial partner for his system but admits that it’s not ready to hit the rails just yet. In fact, it has yet to be tested on a moving vehicle. The team still needs to develop a control system and protocols for handling multiple satellite feeds.